Your next flavor-loaded side dish is here! 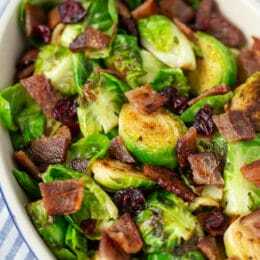 Fresh, healthy Brussels sprouts, crispy chopped bacon, and sweet chewy cranberries combine for a veggie side that kids love. Seconds, please! 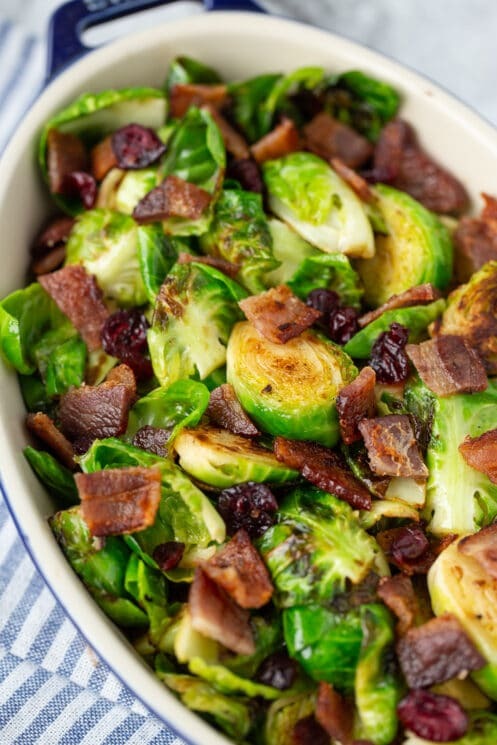 Did you know kids can LOVE Brussels sprouts? Not just tolerate them, or like them… but really love them, in that “Can I have more please?” way that you thought was only reserved for mac and cheese. If that seems far-fetched, then you’ve come to the right recipe. Because these Brussels sprouts are the ones that can turn it all around. 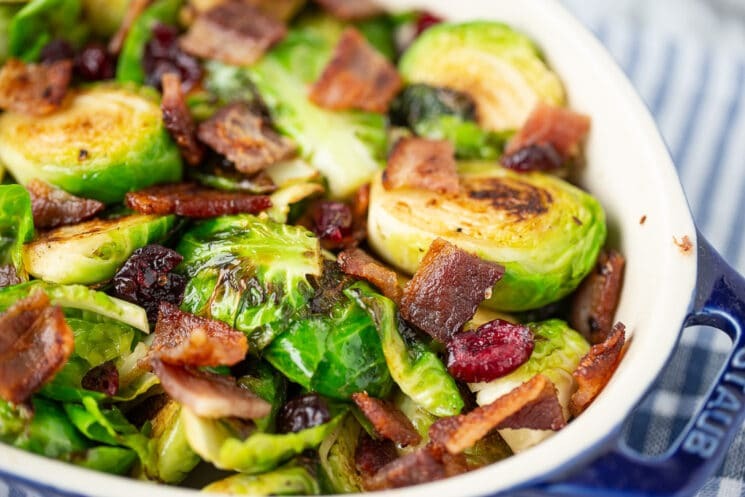 These cutie cabbages have crispy, garlic-buttery exteriors, tender-crisp interiors, and and two accompaniments almost everyone loves: crispy bacon and sweet chewy cranberries. You’ll find that this recipe comes together very very quickly, especially if you can manage to squirrel away a couple of slices of cooked bacon ahead of time. 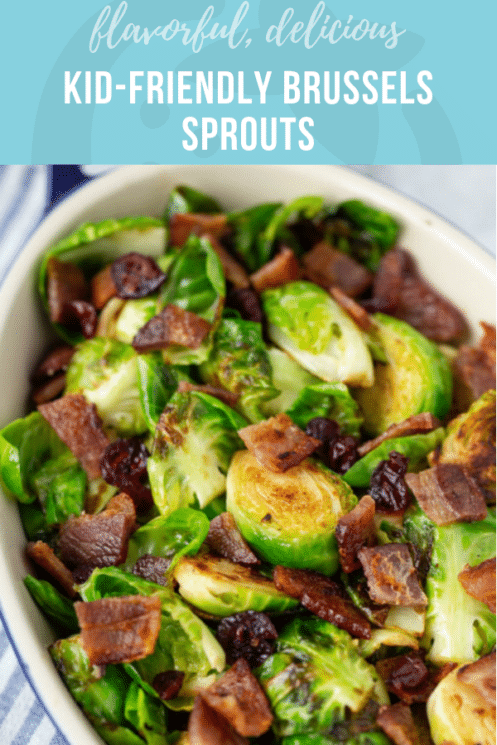 So you can saute up these sprouts any old weeknight to serve alongside simple chicken, rice, or pasta. With its bright red and green colors, this recipe impresses as a holiday side dish, too. What Makes Brussels Sprouts So Good for You? 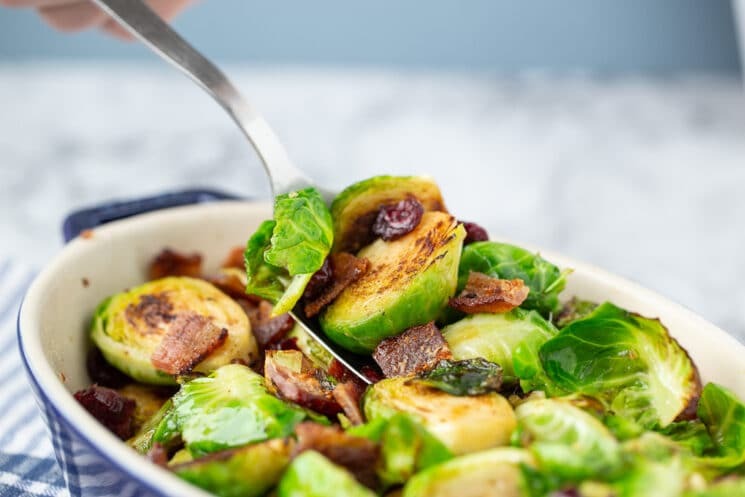 Brussels sprouts belong to the family of cruciferous vegetables (others include broccoli, kale, and cabbage,) and this is a super high-achieving family when it comes to nutrition. These veggies are rich in fiber, Vitamin K for healthy bones, and Vitamin C for a strong immune system. The antioxidants in Brussels sprouts may calm inflammation in our cells and evenprevent cancer. 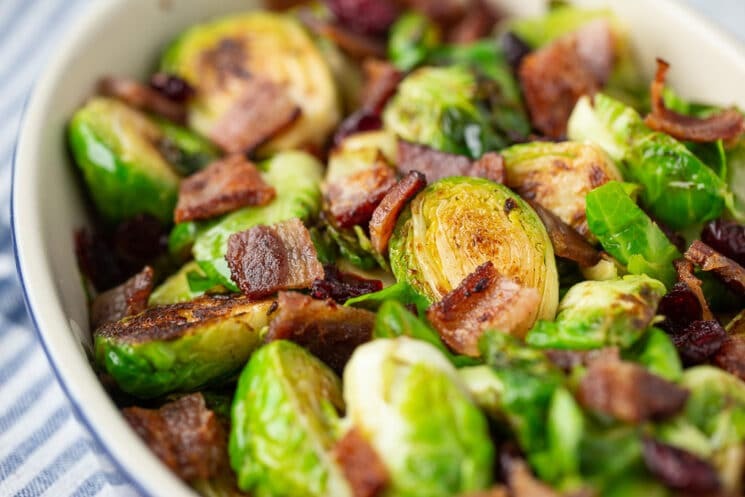 Like other cruciferous veggies, Brussels sprouts help maintain healthy blood sugar. Eating lots of them lowers your risk of developing diabetes. Brussels sprouts also happen to be one of the best plant sources of omega-3 fatty acids, an important nutrient that’s usually found in fish. What makes this recipe such a powerful weapon against kids’ dinnertime nose-scrunching? We’ve taken three ingredients with loads of kid appeal, and built them into one healthy side dish. Crispy pieces of bacon? Check. Sweetened dried cranberries? Check. Good old fashioned butter? Totally checkin’ that box too. And remember this other tip to help your kids move towards greater food acceptance skills: let your kids see YOU love these Brussels sprouts. Talk about the different tastes and textures of the dish, and compare the food to something they might have tried and liked before. Brussels sprouts can seem intimidating if you’re not used to cooking them. You might be thinking, OK, got the mini cabbages in my fridge, now what? Give your sprouts enough room to spread out in the pan. You don’t want to overcrowd them, or else some sprouts won’t get those nice caramelized edges you’re going for. Keep the heat on the lower side. Brussels sprouts actually have a fairly high carb content for a veggie, so they brown quickly on the outsides. Keep the heat medium-low to prevent over-browning. Don’t be afraid to braise. To quickly tenderize Brussels sprouts that just aren’t getting the hint, add just a tablespoon or two of water to the pan, and cover for one or two minutes. That hit of steam often does the trick. Melt butter in a medium saute pan over medium heat. Add garlic salt. Add Brussels sprouts to the pan and saute over medium heat for 8-10 minutes, or until tender on the inside and a brilliant green hue. Add bacon and craisins and saute for 1 more minute. If you add a tablespoon of water in the initial mix and then cover them in foil for 10 minutes and then uncover them for the final 10 minutes, the interiors are softened, i.e., cooked, just a little more. I have never been there, but want to now! That looks delicious! Thanks for the recipe! Such a great idea – thanks for the tip! Help – what did I do wrong? The sauce mixture tasted awesome, but once I put it all in the oven, it ended up burning to a crisp before even 15 minutes was up. The sauce mixture was bubbly and black and the cranberries were charred. 🙁 It was supposed to cook at 450 for 15-20 minutes, right? I can tell that this will be a great recipe – just not sure if I should reduce the cook time or the temperature? Thoughts? Darn! The first thing I would try is turning the temperature down. It is possible that your oven cooks hotter than others. Try 400-425. The other thing to try is what another reader suggested – for the first 10 minutes cover in foil and then uncover for the next 10 minutes. Good luck and I hope they turn out! My 5 year old says these Brussels sprouts are delicious!! I do too! Thanks! Thanks, will try these adjustments next! I heave learned it is very unhealthy to cook or heat honey and never cook with olive oil that high. It’s cancer causing. We should only use refined oils at that high of a temp. Also, another recipe you posted said to peal a cucumber. That is where most of the nutrition is. I’m sorry to be so negative, but I waste a lot of hours looking for new recipies and most of them are not that healthy. 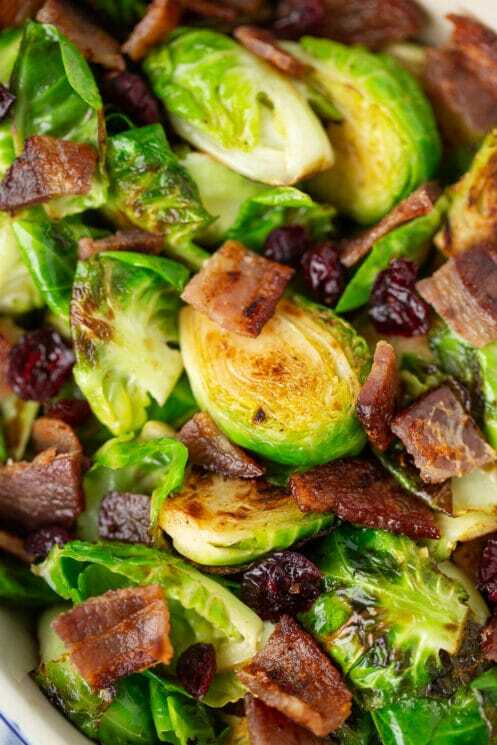 Can I recreate this recipe using frozen sprouts? This is a fantastic recipe. I hate brussels sprouts. Really hate them. The last time I ate them, I was 8 years old and I vomited them up all at the table. However, now I have a child and I need to teach him to eat properly. So together we made this recipe… and we *both* loved it. Me as well. I went up for seconds. This is my go-to recipe from now on for brussels sprouts. Please note that parmesane is not vegetarian cheese, so this meal is not vegetarian (refering to tags). I loved this recipe and think my kids will to but would love to have the nutrition information listed if possible. I added some red pepper flakes to add a little kick.